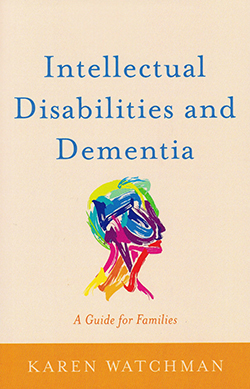 Independent trainer Robert Jenkins reviews Intellectual Disabilities and Dementia: A Guide for Families. This guide book is aimed at family carers of people with learning disabilities who have dementia. There are five main chapters covering: dementia, health changes, diagnosis, support strategies and future concerns. The strength of this text is that it covers a range of issues in this complex area of practice which carers are likely to want to know more about. For example, signs and symptoms, communication methods and living arrangements which may differ for this client group compared with the general population. In making the guide more geared towards the lay carer, nurses with a specialist interest in this area may find the text rather limited and lacking critical appraisal in terms of clinical practice. However, there are a number of useful areas explained throughout such as terminology, pain, medication, recognising changes in health and support after diagnosis, as well as individualised planning. Finally, there is a welcome air of optimism with this text and I would therefore recommend this guide for all those who either care for, or support, people with learning disabilities who have dementia.